For the average park dweller, the Humber River floodplain beneath the Bloor St. W. bridge can seem underwhelming on a cold and dreary April afternoon. The empty plastic bottles scattered along the muddy path distract from the loud river tide and vacant natural land nearby. But one group has called it a sanctuary, using the area to install plants that were once cultivated by their Indigenous ancestors thousands of years ago. With a couple of gardens across Greater Toronto, the grassroots organization Naadmaagit Ki Group (NKG), Anishinaaabe for “helpers of the Earth,” has used agricultural initiatives to restore connections Indigenous people have to natural land in the city. However, NGK’s plans for the Humber River area between Lawrence and Eglinton Ave. W. have raised questions for the group and city officals that speak to the long-standing issue of land access. The Humber River parkland location was the second site introduced to the group in 2013 and it holds cultural significance. Also known as the Toronto Carrying Place Trail, the Humber River was designated a heritage site in 1999. Going from Lake Ontario to Lake Simcoe and the Upper Great Lakes, the Humber River acted as portage route for Indigenous communities and later the French. A 2001 Globe and Mail piece by Ian Merringer recounts that The Huron and Petun First Nations established fishing camps along the Humber Valley almost 12,000 years ago. “When we started, people thought, ‘Oh, it’s a tree-planting exercise. They will go away once the trees are planted in the ground and the grant is gone.’ That’s not what’s happening. What’s happening is that Indigenous people – many who can’t get out of the city – are finding this place,” said Doug Anderson, who is one of the founders of NKG. The present-day site hasn’t only been used to cultivate Indigenous plants such as red osier dogwood, a shrub widely known for its shiny red bark and witch hazel, another small shrub, commonly used as a traditional healing medicine, which is sold in many pharmacies today – there has been an attempt to revive the Indigenous cultural space. Other Indigenous peoples in the city have built a teaching lodge along the shorelines of the Humber River, which has been used for naming and pipe ceremonies. Indigenous midwives and parents have also discussed using the area as a safe ground for those who wish to honour birth traditions like burying their children’s placenta. Some groups have begun to develop language revitalization workshops on the land. Toronto and Region Conservation Authority (TRCA), a non-profit organization responsible for restoring Canadian watersheds, owns half of the Humber River and half of the city’s public parklands. Under Canadian law, the Humber Parkland sites are the “property” of the Toronto and Region Conservation Authority, which is managed by the city. NKG feels this isn’t reflective of Indigenous law or cultural concepts, which sees the very idea of land or water ownership as alien. 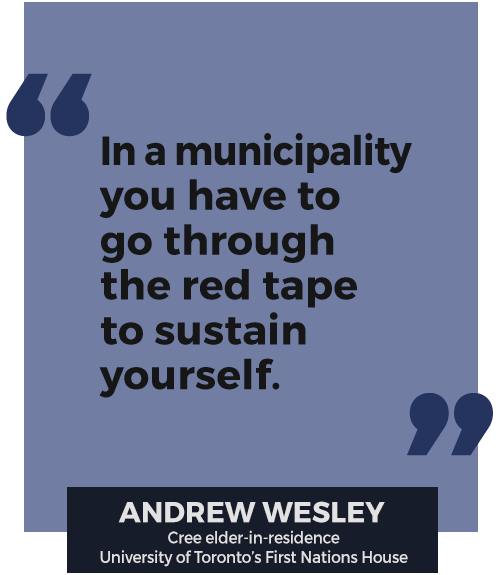 “The city perceives any group that wants to do something as needing their oversight,” said Anderson. According to Mathew Cutler, a spokesperson for Toronto Parks Forestry and Recreation, “agreements with our partners help to ensure that there is clarity on both their part and on ours of the nature and limits of our relationship.” But after deliberating with the city for about three years, a final agreement still hasn’t been reached, which might put the group at risk of losing funding in the future. “For 60 years, it’s been a disaster ecologically and environmentally. It hasn’t been tended to, so Indigenous people are coming to this site and saying, ‘We’ll take care of it,’” Anderson says. For many Indigenous people in the city, having an uninhibited relationship with the land that was once lost is still important. The natural environment presents a sacred relationship. For many, the land, otherwise referred to as “Mother Earth,” sits at the core of Indigeneity. The land has always served multiple purposes: used for food, medicine, spiritual healing and traditional knowledge. For Andrew Wesley, a Cree Elder-in-Residence at the University of Toronto’s First Nations house, the land serves as a resource for all things. “The land for us, carries values, stories, it carries your history,” said Wesley, who is from Fort Albany in northern Ontario. According to the Mississaugas of the New Credit First Nation Toronto Purchase Specific Claim document, the terms of the 1787 Toronto Purchase Agreement were so vague, they weren’t enough to “make an official surrender or sale,” and did not grant legal ownership of the land. The Indian Act legislated in 1876 gave colonial governments tighter control over food sovereignty and restricted all relationships Indigenous people had with the land. The legacies of such agreements are still felt today. Chris Alcantara, a political science professor at the University of Western Ontario, who has written on comprehensive land claims, believes that there should be ways for the City and indigenous groups to cooperatively work together. “These groups are more worried about the land and taking care of the land. A formal agreement is probably not the answer,” said Alcantara. With studies increasingly outlining access to green space as a determinant of better health, the Toronto Parks Forestry and Recreation plan was created in 2013 and aimed at ” improving the quality of life for Toronto’s diverse communities.” One of the deliverables of the ‘park plan’, promised by 2017, included supporting the needs of active and passive users, and accommodating spaces for natural areas and habitat, tree canopy, community events, urban agriculture and cultural expression. Still, in a city with over 40,000 indigenous people, very few spaces exist that allow for an uncontrolled relationship to natural land in the city. Last year, the city held consultations with Indigenous stakeholders to ensure an “Indigenous lens” is considered in the Parks and Public Realm plan – a larger revitalization project, aimed at improving access to public areas and “identify parkland improvement” in Toronto’s downtown core by 2031. So far, the city has incorporated this through initiatives like the “shared path,” a self-guided trail with plaques commemorating the heritage of First Nations communities that settled along the Humber River.